In order to recruit, motivate and retain an effective workforce, organizations must have an appropriate reward strategy. 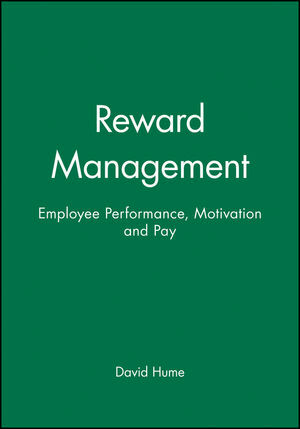 This practical and accessible text discusses reward management policies and strategies and examines the key components of the total remuneration package. The author evaluates the effectiveness of various elements of the renumeration package and relates this to theories of motivation associated with the individual and organizational performance. All aspects of reward management are discussed, including: * Performance related pay, equal pay and pay structures * Pension schemes * Management of the reward system * Renumeration packages for expatriate workers Providing a succinct introduction to the subject for undergraduate and MBA students of HRM and those taking the IPD Reward Management course, Reward Management will be of great interest to all HR professionals. David Hume is a Lecturer in Human Resource Management, The Scottish Agricultural College, UK. 1. Employee and Organizational Performance. 5. Developments in Payment Systems. 11. Systems of Performance Related Remuneration. 12. Remuneration in an International Context. 13. Managing the Reward System. * A practical and succinct discussion of all aspects of Reward Management. * Policy formulation and implementation in a rigorous academic context. *Evaluates the effectiveness of various elements of the renumeration package.